Includes Static or Motion Settings of Red and Green Lights! 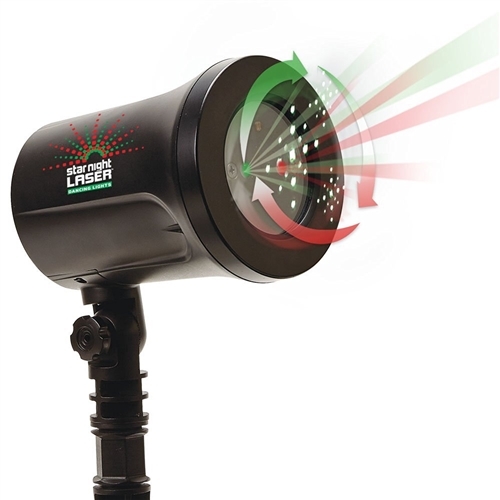 Shower your home with thousands of star lights with this laser light projector. With 7 design patterns including static and motion lights in red and green. Easy install- just plug in and turn it on! Star Night Laser Dancer Lights shower your home with stars and lights instantly! Just plug them in, point, and thousands of star lights project. Star Night Laser Dancers create a dramatic 3-D effect, with lights that dance before your eyes! There are 7 different design patterns to choose from- static red or green, motion red or green, static red and green, motion red and green, and all combinations. One Star Night Laser can cover up to 3,000 sq ft. Star Night Laser Dancers are perfect for Christmas, the 4th of July, Halloween, or anytime you want to create a magical setting at your home. Star Night Laser Dancers has a built in timer, are water resistant and include 8 program modes you can set with ease.